Who doesn’t love a bread bowl? They are airy, carby and crunchy and the perfect vessel for both soups and stews. But just when we thought the bread bowl couldn’t get any better, the universe went ahead and proved us wrong. Enter the Panera double bread bowl. The bowl, which is crafted from a loaf of sourdough bread, will have two cutouts — ideal for sharing or for indulging your indecisive (and very hungry) whims. Customers can fill the bowls with soup, mac and cheese or — our personal favorite — soup and mac and cheese. That said, if all of this sounds too good to be true, hold on, because there is a catch: The double bread bowls are being test marketed — which means that for now, the DBB is only available at select Panera Bread locations in Philadelphia. According to CBS 3 — the Philadelphia CBS news affiliate — the double bread bowl will be at 32 Philadelphia cafés. The good news is that customers in the City of Brotherly Love can order the double bread bowl both in store and online. All you have to do is add an unsliced loaf of sourdough bread to your cart and then write, “make the sourdough a double bread bowl” in the special instructions. 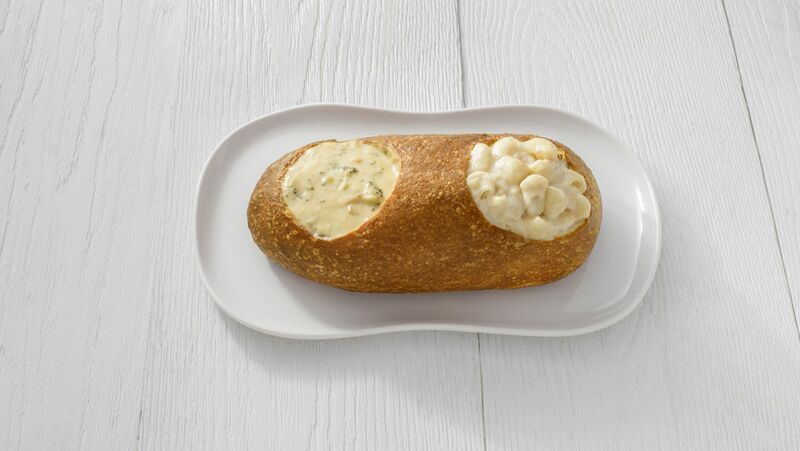 The bowl, which ranges from $12 for two soups to $21 for two servings of mac and cheese, will be available from Aug. 5 through Aug. 31 and, if the bowls do well, Panera has stated that there’s a "potential nationwide launch in the future."